Enhanced version of SpiralBound, popular Stickies replacement. Is there a better alternative to SpiralBound Pro? Is SpiralBound Pro really the best app in Desktop category? Will SpiralBound Pro work good on macOS 10.13.4? SpiralBound Pro is a note utility modeled after a set of spiral-bound notepads with organizing, security, calculator, and email features. You can flip, tear out from, or return pages to your notepad or notepads, and reorder pages as desired. 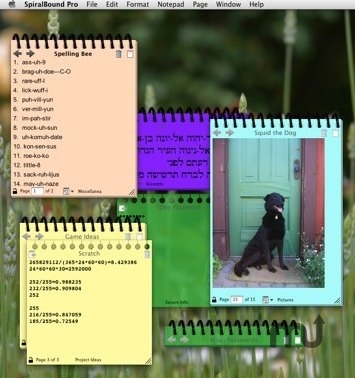 The "Notepad Sorter" window lets you view, rearrange, or weed pages easily. For security, any page can be rendered unreadable when the program is in the background, has been inactive for a period of time, or whenever the "lock" is clicked. You may also choose to require a password to unlock pages. A seamlessly integrated calculator will solve a mathematical expression typed into any page. Also, any word or phrase can be made into a hyperlink. Pages are searchable by title or content, and an unobtrusive pull-down menu on each notepad allows for quick navigation. Pages can also be hidden, or set to float above all other applications. Email the content of any page, whether text or media, (as an attachment or plain text) using Apple Mail, Eudora, or Entourage. To ease the transition from Stickies or SpiralBound, SpiralBound Pro can import your data automatically. Also features automatic updates and check-for-updates.